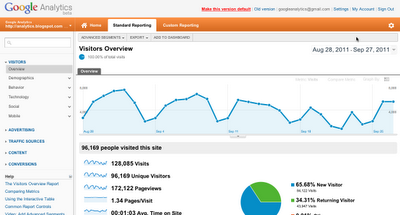 : The Home tab holds all reports and features that allow you to quickly understand what is happening on your site. You’ll find your custom dashboards here as well as your automatic and custom alerts from Google Analytics Intelligence. Standard Reporting: All the built-in reports to understand your audience, advertising impact, traffic sources, conversions, content, and more are now displayed in one central place. We're also excited about the addition of a report finder in the Standard Reporting tab. This will allow you to type the name of a report you’re interested in and quickly navigate to it without needing to hunt for it in the proper section. Custom Reporting: Google Analytics lets you build your own reports to get exactly the data you need. With the new tab, we’re making Custom Reports a more important part of the interface. You’ll be able to access any reports you’ve created here and build new ones. So what's next for our designers? We have a number of improvements planned to the overall Analytics interface to bring more focus on data, as well as exciting new features that will make analyzing data faster and easier. If you'd like to help shape Google Analytics and want to participate in future user studies, please register here. UPDATE: 10/14/2011 11:25am PST - And we're back. The design updates are back on for everyone. UPDATE: 10/7/2011 9:30am PST - We've temporarily turned these updates off for a couple days to fix an issue. They'll be back in a couple days. UPDATE: 10/6/2011 3:00pm PST - These updates are now live in the new version. Enjoy! In March, we unveiled the new version of Google Analytics that included, along with many other improvements, a redesigned user interface. Since then we’ve heard from many of you on how we can improve different aspects of the design. Designers from our User Experience team took a step back objectively asked "How can we make Analytics better?" They focused on the core organization (our information architecture) and way-finding as areas that could be improved. What followed were a series of brainstorming sessions with engineers and product managers, analysis of your feedback, customer interviews, card-sort studies, and general user testing – all done to iterate on our product while keeping our users involved in the process. Next week we’ll release these changes. The biggest change you'll notice is that we have simplified the primary navigation into three tabs – Home, Standard Reporting, and Custom Reporting – to give you quicker access to the information that matters. We also incorporated the second layer of navigation that appeared in "My Site" throughout the Home and Standard Reporting tabs. 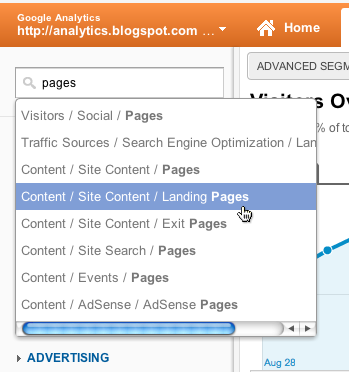 Home: The Home tab holds all reports and features that allow you to quickly understand what is happening on your site. You’ll find your custom dashboards here as well as your automatic and custom alerts from Google Analytics Intelligence.